How fitting to find two 2002s on Teutonic Tuesday! 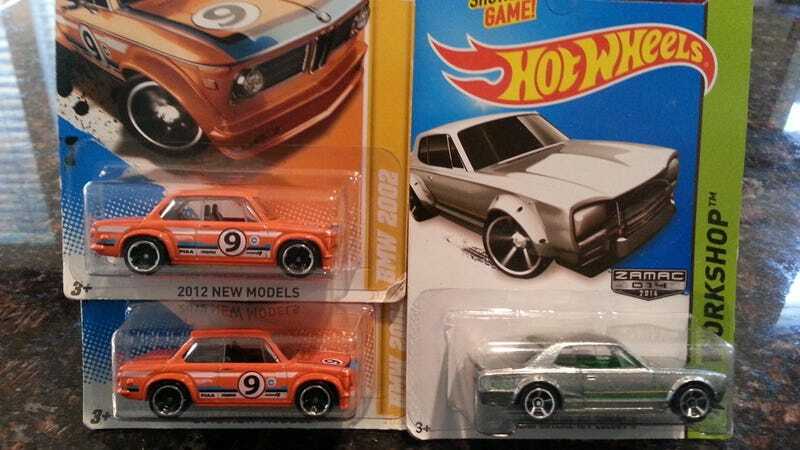 And cool to still find a Zamac Hako in the bin after leaving five back over a month ago. These are all up for trade, though I'm letting BoxerFanatic have dibs on the Hako if we can work out a trade. Looking for: RX-7s (blue, black, or silver), 240Zs (not the new white), The Homer, and on the crazy off chance someone has an extra Datsun 510 (not likely!). Open to other suggestions! P.S. I hate dump bins! It drives me crazy trying to dig through them. I want to just fill up a shopping cart and organize it all, but I also don't want to be that guy going nuts on Hot Wheels in the middle of the day either! I also hate how cards end up getting damaged as you sort through. But, finding buried treasure definitely makes it worthwhile.